How can you get a more defined body in just 3 steps? Want to build a muscular, toned and defined body? We tell you how, but before that it’s important for you to know what happens to your body during this process. You might be at your ideal weight (according to the Body Mass Index) but you still have excess fat, which might be preventing you from having the body you want. 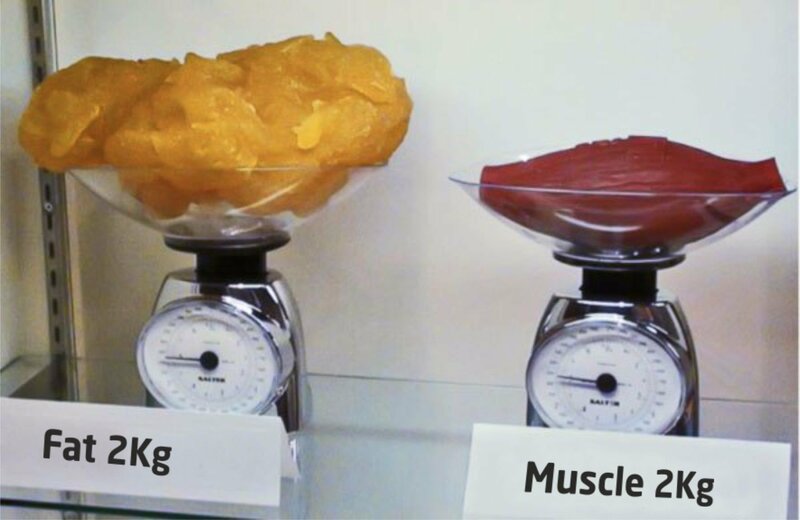 By losing weight, you lose fat and muscle, but in order to be more defined, that’s not what you want. During the process of acquiring more definition, the goal is to lose fat while maintaining or increasing the amount of lean mass (muscle). A defined body, that’s lean and without excess fat starts in the kitchen. Reducing the number of calories you consume is a start, but not if you’re going hungry. Eating regularly should also be a priority. Besides helping you to feel full, studies reveal that it also helps you to burn fat, which is essential to having a defined body. Proteins, carbohydrates and fats are the macronutrients you need to balance. They’re the key element in this process. They’re the building blocks of muscles. Consuming protein will avoid lean muscle mass loss and help build and repair muscles after exercise. In addition, it will help you feel full, reducing appetite. The best sources are: meat (such as chicken or turkey breast), fish, eggs and dairy products. They’re necessary, though in the right portions, since they’re the main source of energy and you’ll need them for your workout. Choose complex carbohydrates. They’re absorbed more slowly, releasing energy gradually. Examples: oats, bread, whole grain pasta and rice and sweet potatoes. Fats are important for the proper functioning of the body. They give energy and help maintain healthy levels of good cholesterol, maintain the immune system functioning properly and are important for hormone production. The best sources are: fish oil, olive oil, seeds, nuts and avocado. When the goal is definition, it’s important to make proportional adjustments in the amount of macronutrients you consume. Protein should be your priority. As a macronutrient with the greatest influence in muscle building and maintenance of lean muscle mass, you should increase its consumption. Our suggestion is to increase your protein consumption by 20-35%. On the other hand, the amount of carbohydrates you consume should be reduced, since they’re one of the main sources of our body’s energy, consuming them in excess can result in the accumulation of fat, affecting your goal of achieving a defined body. That’s why you should reduce your carbohydrate consumption by 35-45%. Fat is also important in this process. It should represent 15-25% of calories in your diet so that it can be used as a source of energy by your body. This diet will be effective if you pair it with physical exercise. Workouts should consist of cardio and weight lifting exercises. Both burn calories and fat and, particularly with weight lifting, you’ll be able to enhance your body’s muscles which will boost muscle building. Cardio can be done in moderation because at the same time that it burns fat, it also burns lean mass and wastes energy that you’ll need for your weight lifting workout! An option is to do High Intensity Interval Training (HIIT), because in addition to helping you burn calories effectively, it’s an intense and fast workout. Read more about HIIT workouts on our blog post! Depending on your goal and your level, you can select (below) the muscle definition plan most appropriate for you! Supplements are a great way to help you complete this process in the most effective and fast way possible. To have a defined and toned body, the maintenance and development of muscles is essential. Protein, while being an essential nutrient for all your body’s tissues, will be essential for muscle building and recovery and for the maintenance of lean muscle mass, especially while you’re losing weight. Protein shakes are an easy, effective and delicious solution to maintain and develop lean muscle mass. Branched chain amino acids or BCAA’s are essential amino acids which means that our body isn’t able to produce and only obtains them through supplements or diet. They form the protein structure. That’s why they’re essential since muscles are made of protein. They help prevent catabolism, promoting the synthesis of protein and muscle building and repair. Glutamine is also an amino acid and is the most abundant amino acid in muscle tissues. During physical exercise, the muscle fibers rip and supplements like glutamine can help prevent them from entering a catabolic state. It promotes muscle tissue building and recovery post-workout, protecting against muscle fatigue and helping to maintain lean muscle mass. L-carnitine will be a great help for losing weight and for defining and toning your body. Its function is to transform excess fat into energy. That way, it can promote fat burning while boosting the use of energy for daily activities and to practice physical exercise, helping to promote muscle definition. To build a defined body with the least amount of fat possible, these recommendations will help make that process easier. Try them!